AS THE EVER-EXPANDING Australian RV market rolls all kinds of rigs off the production line, an interesting niche has started to make its presence felt. 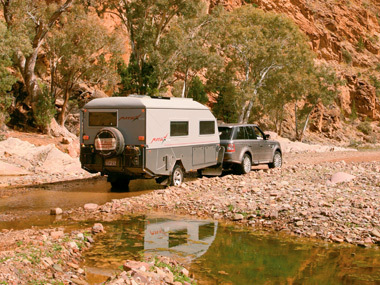 The last few years have seen the emergence of a unit that can be described as a hard shell camper trailer, but which shares much in common with a purpose-built offroad caravan. I compare this new rig to a hard shell camper because most of these types of rigs have been built by camper trailer manufacturers. 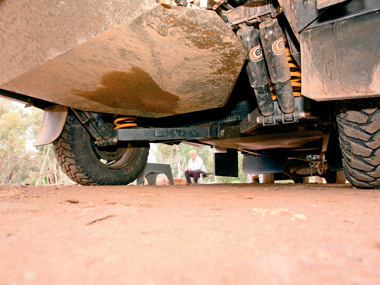 One example is the Matrix from Australian Off Road (AORC). Operating under the direction of Steven and Rhonda Budden, AORC builds a number of high end camper trailers. 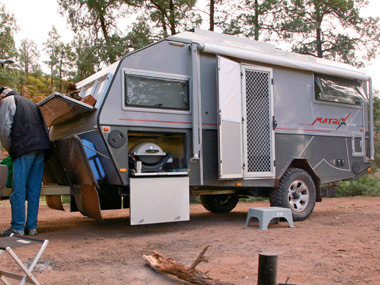 The Matrix is essentially an evolved version of the company's earlier Quantum, which has been a popular unit over the years but only comes with the camper-style external kitchen. According to Steve, the company had a number of requests for a camper with internal cooking facilities, and so the Matrix was born. A prime concern for the designers was keeping the Matrix's weight down - even though many campers like a few home comforts, they don't want to tow a large caravan through the bush. The bush seemed an appropriate place to put the Matrix to the test, and in this case we chose SA's Flinders Ranges. We headed for Brachina Gorge where at this time of year it can be very pleasant during the day but very cool at night. This environment proved a good test for the Matrix's insulation, which worked very well. My tow vehicle for this test was a Range Rover Sport (there's nothing like slumming it) and I have to say the whole combination proved a very well behaved towing setup. I should also mention that quite a few vehicles lighter and cheaper than the Rangie would be eminently suitable towing candidates. The Matrix is underpinned by a powder-coated steel chassis, which rides on AORC-designed independent trailing arm suspension with coil springs and twin shock absorbers on each wheel. There are also 12in brakes and 2200kg bearings on each 15in wheel. Two 140L polyethylene water tanks are fitted fore and aft of the wheels and although they are probably strong enough in their own right to stand up to some rough road punishment, both tanks have full galvanised sheet protection. 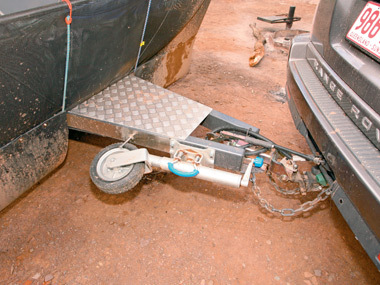 In the towing department, the drawbar is fitted with a Hitchmaster DO35 offroad coupling. Fibreglass is the material of choice for the roof and walls - a composite construction that uses vacuum bonded inner and outer fiberglass cores with poly foam insulation in between. This combination is designed to provide strength while maintaining a lighter weight. That same theme continues in the Matrix's interior, with Nycel (a plastic composite) used for the kitchen cupboards and aluminium for the overhead lockers. The aluminium is not obvious, however, because the lockers and the ceiling are upholstered in vinyl. One battle constantly fought by many RV manufacturers is dust exclusion, but AORC has had some considerable success in this area. This particular Matrix has no permanent vents and uses pinch weld seals for the external bins and the interior living room. I specify this particular Matrix has no vents because it features a diesel-fired Webasto cooktop, eliminating the need for venting in places like the door. Personally, I have usually found diesel-fired cooktops, with one primary burner and another to simmer, somewhat limiting. I understand the Buddens have had the same experience, so I expect further developments in this area. 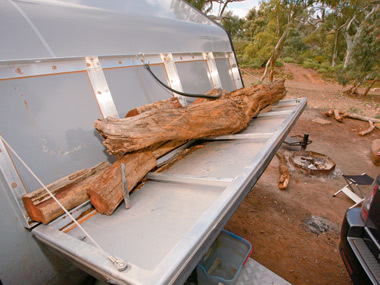 Looking further around the Matrix body reveals a front offside storage bin and larger drawer, as well a pole/fishing rod holder, hinged firewood carrier (essential in places like national parks), and a stone guard-protected drawbar with two 4.5kg gas cylinders, two jerry can holders and a Hitchmaster DO35 hitch. 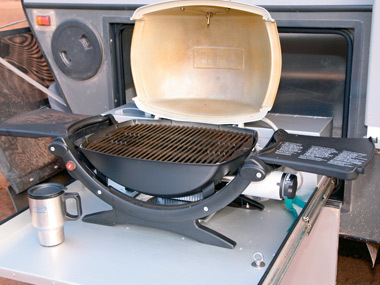 And in addition to the internal kitchen, the nearside slide-out Weber barbecue offers travellers the best of both catering worlds. Other items that caught my eye were the larger than usual and custom designed (in some cases) brackets for items such as the awning, and the rear mounting bar for two more jerry can holders and the spare wheel. 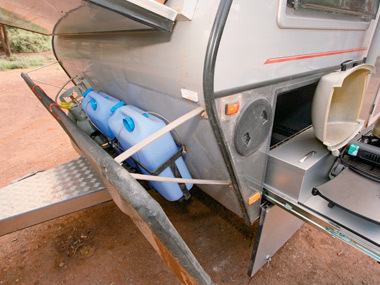 The rear bar even features a separate zipped compartment for carrying rubbish out of environmentally sensitive areas. Stepping inside, how you view the Matrix will depend largely on whether you come from a camper trailer or caravan background. However, I have to say that even caravanners (like me) will appreciate what has been achieved here, especially given one of the design constraints was keeping the external width within tow vehicle peripherals. The Matrix fits a front north-south bed, rear nearside kitchen, offside corner bathroom and offside dinette into a length of 4.9m (16ft). Impressive. Somewhat surprisingly, the kitchen bench is quite a good size - I have seen far smaller kitchens in much larger rigs. The L-shaped bench houses a stainless steel sink avec drainer and the aforementioned diesel-fired Webasto cooktop, which is tucked into the corner. This design allows plenty of bench space. Six large drawers mean there is also ample kitchen storage, although some space is taken up by the dual 100Ah AGM house batteries. 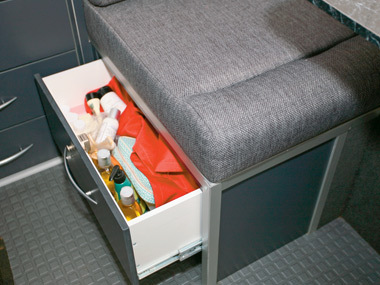 The Vitrifrigo 130L fridge sits above its remote compressor between the drawers and the entry door. In a compact rig such as this one, which is designed to travel to some very out of the way places on rough roads, the bathroom cubicle is not going to be oversized. The Matrix's bathroom, however, contains a Dometic vacuum-flush toilet and a flexible-hose shower, both of which are vented by a roof hatch. A small point to note is the drain bung for a dustproof interior - not to be forgotten when showering. In addition to the internal shower, there is also an exterior unit for those who like a quick rinse before hopping aboard. 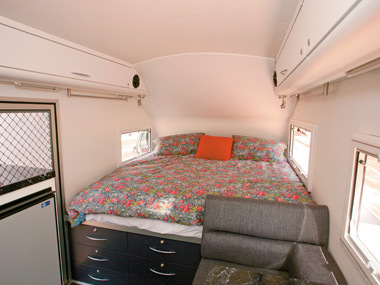 As is the case with the rest of the van's interior, the front queen bed maximises the available space, with overhead lockers and towel rails on either side, plus a slew of drawers underneath. Windows on either side allow very good cross-ventilation, but I wondered if a roof hatch above the bed would have been better for warmer climates. A winter's night in the Flinders offered very little help there. This may be a small rig, but its technology is very sophisticated. Two 135W solar panels keep the batteries charged when out bush and a 300W inverter supplies the separate 240V inverter GPO circuit. Additionally, there are interior and exterior mains supply points. 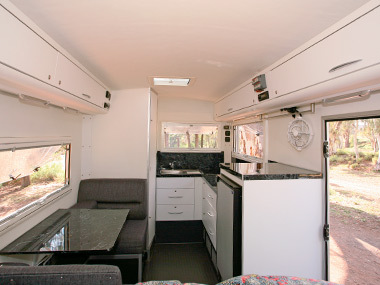 Keeping energy use to a minimum, LED lights are fitted inside and out, while the Eberspacher diesel heater, Truma water heater and inverter hide under the dinette. One of the dictionary definitions of the word "matrix" reads: "An environment in which something develops." This seems fitting given the considerable experience and design knowledge at the AORC factory that went into this rig's construction. 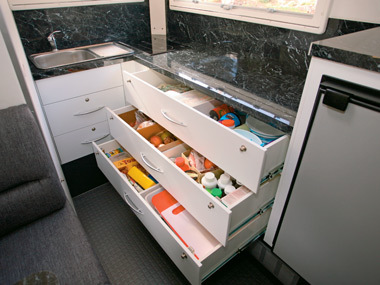 One of the questions the Matrix raises is what RV classification it fits into. 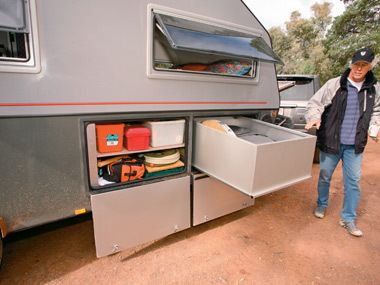 Given its lighter weight, size and suitability for offroad tracks, the camper trailer background is immediately evident; however, the hard shell and interior fittings suggest a caravan. It may just be that AORC's Matrix is leading the way in a whole new - and very exciting - category of offroad RVs.